Differentiation is a key aspect of teaching and learning and is so important to the success of our students that it is a requirement in the foreword of the National Curriculum for England. Curriculum Specialist, Laurie Barton, tells us more below. The curriculum, which describes differentiation as inclusion, states: Teachers should set high expectations for every pupil. They should plan stretching work for pupils whose attainment is significantly above the expected standard. They have an even greater obligation to plan lessons for pupils who have low levels of prior attainment or come from disadvantaged backgrounds. The curriculum goes on to state: With the right teaching, that recognises their individual needs, many disabled pupils may have little need for additional resources beyond the aids which they use as part of their daily life. Of course, the National Curriculum for England is not the only curriculum that champions differentiation – in fact, across the globe, teachers are designing lessons that support the least-to-most-able students. And differentiation can take many forms – BBC Active suggests that there are as many as seven different methods for differentiation – everything from designated grouping, to differing outcomes (sometimes referred to as “some, most, all”) and even how and when students are given formative assessment. One of the easiest ways is through differentiated resources. Teachers can use multiple resources (and even types of resources) to meet the learning needs and preferences of all of their students. For example, some students may use text, while others prefer images and videos to explain a concept. Some students may require basic information with only the key facts, while other students can be challenged with complex vocabulary and ideas. While a variety of resources can help teachers meet their inclusion needs, it can be quite an onerous task to find these materials and so many teachers have to create them. This is where Britannica’s rich and diverse resources can help teachers save time, while still guaranteeing high-quality, classroom-ready information. For example, Britannica School articles have three reading levels to support struggling readers up to able readers. Handy tools such as a listen aloud tool and an in-built dictionary help students to get the most out of each article. Furthermore, Britannica School includes not only articles, but also images, videos, academic journals, primary sources and even recommended websites – all levelled just like our articles. And best of all, it’s so easy to use – type in your search term and get back editorially-verified, student-focused information across the curriculum. 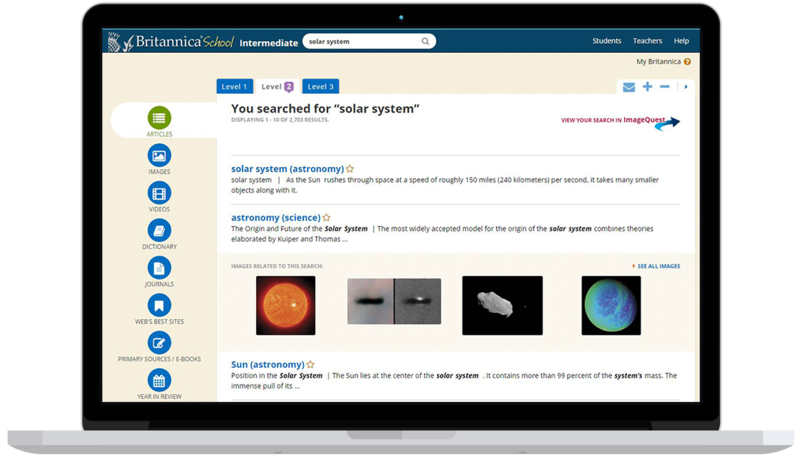 Do you want to trial Britannica School for free? Speak to our team by clicking below, and we can arrange a trial for your school today.